ZOMG Threadless has new stickers! WOO…hope I get the new one in my order that is on its way. Love the rhino..it’s my fav shirt! Oh no, new stickers! Like I need more encouragement to shop from there… Love how the characters are from their tees. Husband recently got the rhino one too! 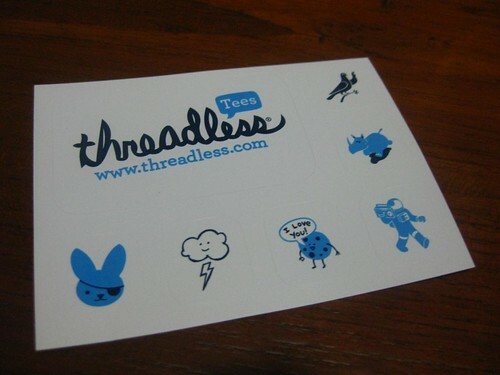 i hear people talk about threadless and have no idea what it is! I wonder if I am missing out. I best go explore. did you end up getting anything? ha! awesome. i cant wait for my order to arrive. they must have had the old stickers for aaaages right?